Department of Commerce, Delhi School of Economics has successfully completed its summer internship placement season for MBA (HRD) batch of 2014-16. The pedagogy of the department aims at an engaged learning approach. The students engage themselves with various business organizations as part of Live Project, Winter Internship and Summer Internship during 2 years of management study. At the end of the second semester, all students are required to undertake a summer training project spread over 8-10 weeks in the industry. The project is intended to give the students a better understanding and appreciation of the real time issues faced while working in the corporate world. The Summer Placement Season this year saw a surfeit of companies visiting campus, offering various niche profiles to our highly talented students. MBA (HRD) batch of 2016 has witnessed unprecedented success. The department gathered stupendous support from the industry this season. It established fresh industry relations and reinforced the existing ones making the process a memorable one. More heartening was the addition of a number of new recruiters, who trusted the quality of students. The summer placement process kicked off in the month of September 2014. This year’s summer internships reflect a gamut of companies from diverse sectors like BSFI, Real Estate, Consulting, IT, Telecom, Healthcare to name a few. Amongst the batch of 49, 90% students have been placed with stipend. The highest stipend was offered by ICICI Bank. 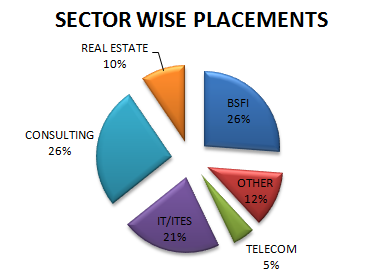 IDBI Federal and Deloitte emerged as one of the largest recruiters with a total of 15 offers.The students have showcased their talent and bagged attractive profiles with reputed organizations. This has paved the path for a bright future. In addition, students take up live projects throughout the duration of the program and a Winter Internship as well at the end of first semester, helping them get continuous exposure to the industry and keeping them in sync with ever changing dynamics of the industry. Corporate Relation Team, MBA(HRD), DSE.